We’re running headlong into the holidays and I’m delighted to announce this year’s specials. Webmaster Level 5 – perfect for designers to get the hard to find training they need to set up sites securely and ensure they perform at peak. It’s the same info I deliver in my 1-on-1 training classes, and now I’m making it available to everyone via less expensive group training. You can sign up for the just the workshop or get the whole course too. If you’re already in the DIY SEO course or VIP level, you get the workshop for free. BlogAid News subscribers got the prelaunch announcement and best deal on the new workshop and the course. So, be sure you’re on that list because I’ve got new programs rolling out soon and you’ll be the first to hear about them. I want to ask a favor of you. If you enjoy all the super info I bring you through this podcast and posts, please do tell your friends about BlogAid. I really do appreciate your help in getting the word out about the rich resources here that you just can’t find elsewhere. And for those of you who are so good to take the time to Like posts on the BlogAid Facebook page and share posts on Twitter THANK YOU!!!!! I see you and you make my day! I know a lot of you laid off social media last week and may have missed some of my posts. Here’s a little link round up of them, including the new performance test results that I’ve been running. That’s all the news from around here. Let’s jump into this week’s tips. A release candidate means that all builds for the next version of WordPress have stopped and it has come out of beta. We’re expecting that release on Thursday. The two big changes this time around are the REST API endpoints finally making it into the core, which was supposed to happen in version 4.5, and then lots of changes to the Customizer. Those new end points are going to affect some plugins. So, I expect we’ll see a slew of updates over the next several months as those affected plugin devs make their changes. I don’t expect to see a sudden burst of plugin updates over this. Changing the plugins at that level is going to take time, and I bet a lot of devs are waiting to see if there are bugs with the core changes first. I’ll be loading it up on my testing site and checking out what’s in it for you. And, you know I’ll have a What’s New video for you when it does release. I was delighted to see that this year’s WordCamp US will be streamed live for free, but you’ll still need to register for a stream ticket. I hope you’ll join me in listening in to see what big directional changes we can expect next as WordPress, and its community, continue to mature. Good images can help tell the story on your site. They can also boost your SEO, reduce bounce rate, and increase conversion. The nice folks over at Foo Plugins have a super post with tips about how best to use images on your site and get the most out of them. Well worth the read. This post on the Content Marketing Institute got my attention. It stems from a question Joe Pulizzi has asked and writes about in his book, Content Inc. I know for a fact there are many of you listening to this podcast right now who look forward to it every Tuesday morning. And most of you have come to rely on BlogAid as a source of level-headed info about what you need to know to become and remain a successful site owner. I know this because you have told me so. Let me ask you. Are you creating the kind of content that your readers crave and look forward to seeing in their email or on social media? This post has lots of super tips on how to create content your peeps crave and how to build a tribe that advocates you and your brand to others. Well worth the read. That’s a wrap for this week’s Tips Tuesday. Find these tips helpful? Share them with your peeps!!!! 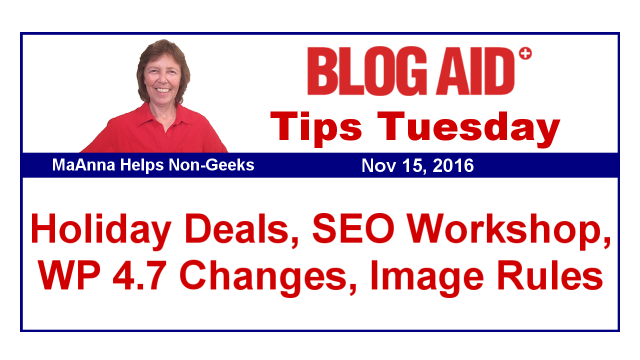 Be sure to visit BlogAid.net for more tips and resources and I’ll see you online.